INTRODUCTION: We have developed expertise in single incision laparoscopic surgery and laparoscopic robotic techniques – focusing on MIS education and safety. These skills provide opportunities for concurrent use of both technologies during individual procedures. In the past four months we have integrated the two technologies and experiences. METHODS: Integration of single-site laparoscopic cholecystectomies, hysterectomies, hiatus hernia repairs and colectomies has been performed using SILS port, UNO port, or GelPOINT for access through the umbilicus. Single-site device selection was randomized. Five and 8 mm robotic instruments and either 8.5 or 10 mm 30-degree robotic laparoscopes were used. At least three of the authors/investigators were present at each procedure to evaluate and document geometry and strategic configurations of instruments and laparoscope as they entered the single-site device, entered the fascial level, and crossed each other. RESULTS: Specific instrument-scope geometric configurations allowed appropriate visualization of the anatomy and generated varying degrees of freedom of the instrument shafts. Each type of operative procedure had its own optimal configuration necessary to accomplish various aspects of dissection, retraction, ligation and excision of structures as indicated. These configurations, their goals, and the anatomical-surgical procedural steps accomplished, will be presented. Further, the strategies employed to implement the appropriate geometric configurations for each procedure – and for various steps in some procedures – will be outlined. Caveats that occur in a variety of these circumstances – as well as their solutions – will be presented for discussion. CONCLUSIONS: The technical aspects of combining single-site approaches to a variety of laparoscopic procedures as well as the introduction of robotic enhancement requires that we make a quantum leap in the application of our surgical skills in these circumstances. 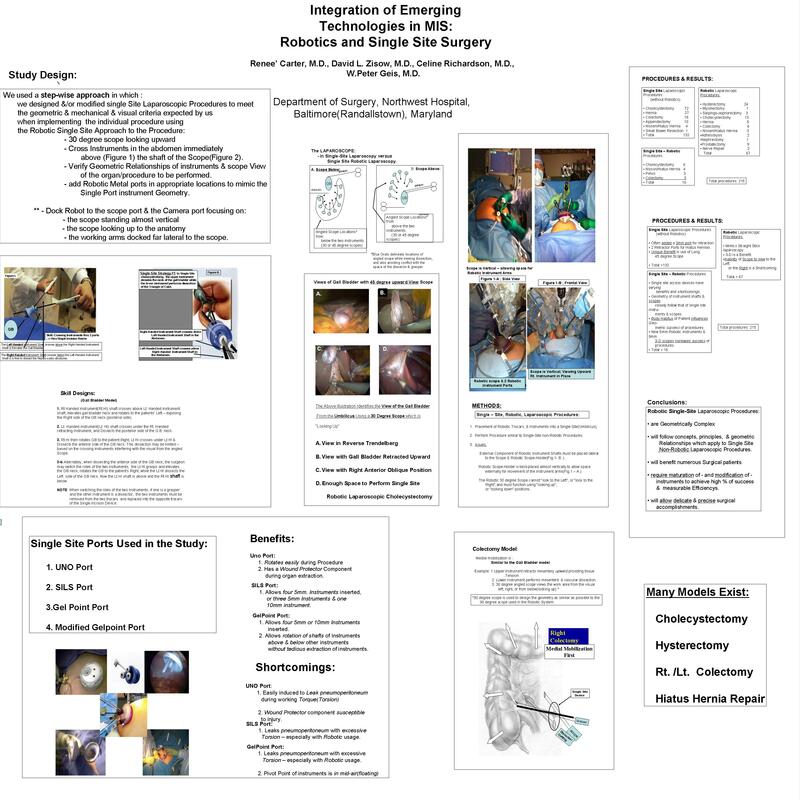 The details of single-site instrument geometry combined with appropriate and discrete docking of the robotic system emphasizes the necessity for surgeons who are interested in these skills to recognize the intense cognitive and geometric skill component with regard to education and experience in this emerging surgical field. Therefore, these authors believe that highly structured educational modules involving complex skills and geometric decision-making are essential to the safe and successful application of these concepts in Minimally Invasive Surgery. We are currently in the process of designing such modules based on these experiences.